A fascinating place to visit while hiking lies within Sleeping Bear Dunes National Lakeshore. Located in the northwestern part of Michigan's Lower Peninsula, Sleeping Bear Dunes is home to beautiful beaches, historic lighthouses, wilderness camping, spectacular views of ocean-like Lake Michigan, miles of rolling sand dunes, and dozens of trails. Sleeping Bear Point Trail is particularly interesting because it is where the Ghost Forest appears to unsuspecting hikers. The sand that makes up the landscape of the Sleeping Bear area is constantly moving. This phenomenon is not necessarily noticeable from one day to the next, but year after year the tiny quartz grains shift little by little. Constant winds blow off of Lake Michigan causing the dunes to migrate and expand, and for new dunes to grow. 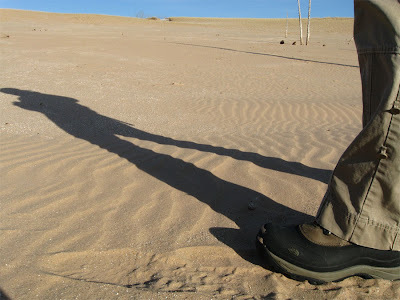 Over time, the drifting and accumulating sand will bury whatever is in its path. This is true for man-made structures such as the U.S. Life-Saving Station (now a maritime museum) which had to be moved in the 1930s due to encroaching sand, and natural objects such as trees. When migrating sand moves into a wooded area, it gradually engulfs and kills the trees. 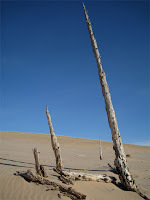 As the years pass and the sand continues on its journey, the trees are eventually uncovered. 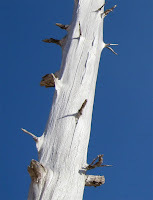 Those that manage to remain standing appear as ghosts – dead, white, and stripped of their branches. 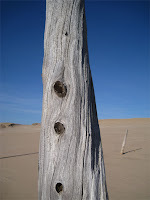 A group of ghost trees haunts Sleeping Bear Point Trail somewhere around the halfway point and is a captivating sight especially if one is not anticipating such an encounter. how safe is camping in the UP? i am a single female w dog (small mutt) who wants to do some campground camping in the national parks up there. i would drive, tent camp and go on day hikes. any thoughts? I live in the U.P...camping here is very safe. Friendly, nice folks and laid back towns. Amy will be fine! I linked on to your site from another one I just discovered. LOVE your photos! I put you as a new favorite. I have some photos on my slideshow of my blog too...of snowy places, birds and flowers from my garden. I would love it if you would stop by my blog and click "follow this blog" in the top left corner! I love to write and having others read me on a regular basis gives me incentive to do so! Plus,I have a personal goal to get 100 followers. So if you like it, please join in as a follower! Just discovered your blog through another website. (I can't trace my steps, but I was looking at info about Eagle River, MI and somehow found you. Your photos are beautiful! And I love your blog. I see you haven't updated since January. I'm in the same boat! I live on Drummond Island, but we go to South Carolina for the winter. I had plans to write from there, but out of sight, out of mind, I guess, because I still haven't got back into it. I'm gathering spring photos from here in the U.P and will be adding them soon.